You are looking at the stunning 3D display London Marathon 2019/18/17 Display Frame Case Medal photo frame to showcase your London Marathon 2019/18/17 Medal and Running Number. 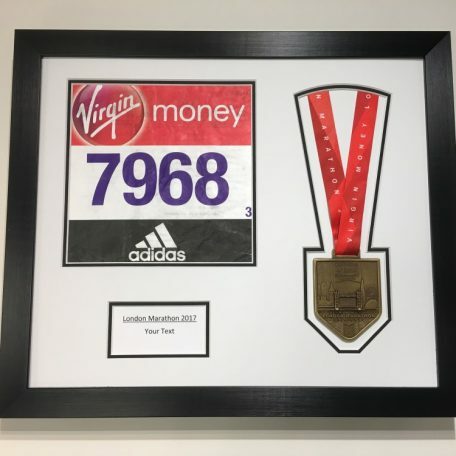 This display frame has been created to hold the new shape 2019/18/17 London Marathon Medal. We have more layout and medal shape options in our store. Display area for your Medal with cut out to replicate the 2019/18/17 Medal. Display area to hold your running number. Text area for you to input any wording you would like. We can do this for you on request please send a message with your purchase. Customise your frame. Choose from 3 Frame Colours and 2 Mount Options. Mount Colour – Choose from Black with White Edge or White with Black Edge. All the frames are supplied with Styrene Glazing (Lighter and safer than glass in transit) the mount colour of your choice and an MDF backing board with hangers already attached. The Display Frame is supplied with simple instructions on how to attach your items. If you are looking for a different layout style there are lots more to choose from in my eBay store.